Dubai: Shelling from Yemen has killed another Saudi border guard, the interior ministry said, the eighth death from Yemeni firing into the kingdom in three days. The latest bombardment hit security posts in Saudi Arabia’s Jazan district at about midday on Monday, the ministry said. The border attacks could be in retaliation for a coalition air strike on Sunday that targeted “a meeting of leaders” from the Al Houthi rebels in their stronghold of Saada, said Brigadier General Ahmed Assiri, spokesman for the Saudi-led coalition which began a military intervention against the rebels and their allies in March. Cross-border shelling from Yemen has claimed the lives of four members of the security forces and four civilians in the kingdom since Saturday. Their deaths bring to more than 80 the number of people killed in the Saudi border zone since the kingdom and its Arab allies launched a military intervention against Yemeni Al Houthi rebels in March. Most of the casualties have been soldiers. In late October Saudi Foreign Minister Adel Al Jubeir indicated that coalition military operations in Yemen appeared to be nearing an end. The kingdom voiced optimism that United Nations-led peace talks would begin, after previous attempts at negotiations stalled. In early November the UN’s special envoy for Yemen, Esmail Ould Shaikh Ahmad, said he was “very optimistic” negotiations would start by the middle of that month. But fighting has continued inside Yemen, as well as in the border zone, with the coalition backing Yemeni anti-militia forces in support of President Abd Rabbo Mansour Hadi. Meanwhile, Al Houthi rebels are said to be shelling residential neighborhoods in Taiz as a response to the Saudi-led coalition’s airstrikes. A Sky News Arabia correspondent said that on Monday, the Al Houthi rebels and forces loyal to deposed Yemeni-president Ali Abdullah Saleh launched a series of attacks on residential neighborhoods in Taiz using heavy artillery. The Saudi-led coalition continued to launch airstrikes and raids on Al Houthi checkpoints, killing as many as 15 rebels. Months of clashes in Taiz, which is the third most populated area in Yemen after the capital of Sanaa and Aden, have resulted in a severe humanitarian crisis, Sky News Arabia said. The Yemeni national army, in cooperation with the people’s resistance and the Arab coalition, achieved progress in controlling the Al Masrakh directorate, located in the Taiz governorate. Sky News Arabia reported that seven Al Houthi militiamen were killed and six were wounded after Saudi-led coalition airstrikes shelled Al Houthi-controlled areas in the Jawf province. Al Houthi rebels have been suffering “enormous” military and human losses, Sky News Arabia reported. The rebels lost control of cities in South Yemen, including Aden and Lahj. Since the Saudi-led coalition began carrying out airstrikes on Al Houthi targets, the coalition managed to destroy Al Houthi tanks, armored vehicles, missile brigades and entire camps. 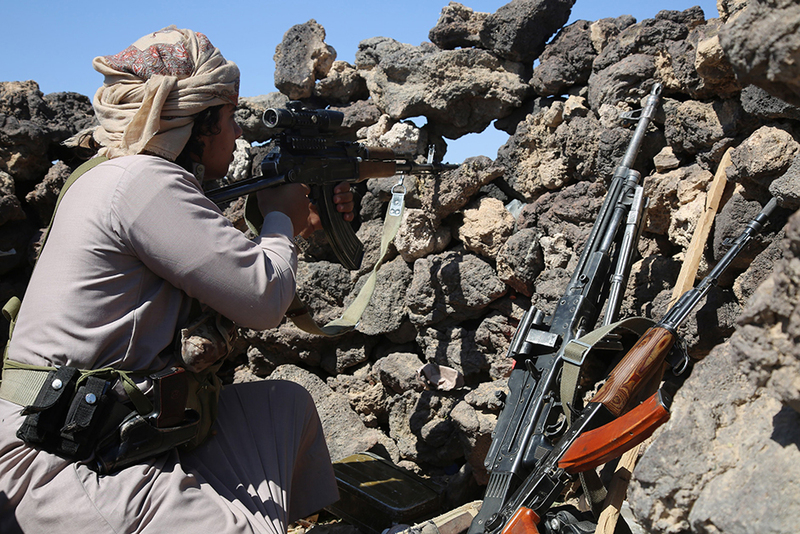 The Al Houthi rebels took control of the capital after a series of military operations in September 2014. Sky News Arabia said there were no official figures available to detail the losses incurred on Al Houthi rebels. However, military sources estimate the total Al Houthi death toll to be around 8,000 fighters, with thousands of others injured. "We are adhering to our commitment to the coalition"